Last week a patient that I treat for an arrhythmia who is 60 years old and in outstanding shape told me that he was experiencing dizziness after doing burpees. His personal trainer told him he should talk to his cardiologist about it. Dizziness is a common complaint of my older patients. Indeed, 30% of individuals older than 65 report dizziness and 50% of the “very old” (older than 85 years) experience dizziness. If the dizziness is described to me as a sensation that the patient is about to “pass out” or lose consciousness or a feeling of everything turning black I figure it has a cardiovascular cause with the blood pressure in the brain arteries globally reduced transiently. I always take this very seriously as this type of dizziness may be the precursor of total loss of consciousness (syncope) or sudden death. One study showed that 57% of patients with dizziness age 65-95 were ultimately felt to have a cardiovascular cause. Bear with me as I attempt to succinctly describe this very important physiologic phenomenon which everybody has experienced at one time or another. Dizziness due to OH occurs when you stand up quickly or rise from a kneeling position. During the process of going from lying or sitting to standing your body has to make some major adjustments to ensure that blood flow to the brain is maintained. As you stand up from lying down your brain suddenly goes from being at the same height as your heart to being (depending on how tall you are) a foot or more higher. Thus, a higher pressure is suddenly needed to keep blood flowing to the brain. The major sensors of blood pressure (baroreceptors) within the vascular system are located in the carotid arteries (large neck arteries providing blood to the brain) and these are constantly sending feedback to the brain. The carotid sinus baroceptors are stretch sensitive mechanoreceptors that modulate what is called the autonomic nervous system to keep arterial blood pressure constant. A second process that occurs with standing is pooling of blood due to gravity in veins in the legs and abdomen. This pooling takes blood, in essence, out of the circulatory system, thus lowering the pressure in the heart which in turn can lead to less blood being pumped into the arteries. Part of the autonomic reflex response to standing then involves constricting veins to reduce pooling. -anything that lowers the volume of blood in your circulatory system. Thus being dehydrated (from vomiting or diarrhea, diuretics, excess alcohol, sweating) or losing blood. A common scenario for passing out from OH is the prep for colonoscopy which induces diarrhea and possible dehydration. Another common scenario is after surgery which causes a combination of blood loss and dehydration (plus other factors) . If you’ve been paying attention and know what a burpee is then you have probably deduced that my patient was suffering from orthostatic hypotension. I was unaware of the term burpee although I had seen members of my gym (under the watchful eye of their personal trainers who seem to specialize in having their clients undergo bizarre and embarrassing exercises (most likely to justify their fees, After all, you don’t need a personal trainer to show you how to run on a treadmill and properly use resistance machines which, arguably, provides all the aerobic and isometric exercise you need for maintaining optimal cardiovascular and muscular fitness)). 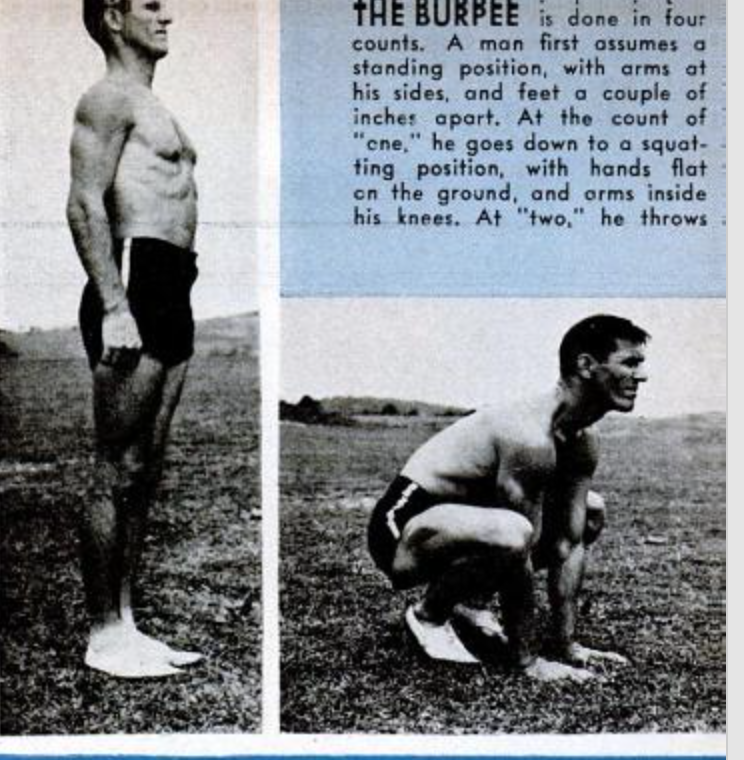 It was named for an American, Royal H. Burpee, who wrote his PhD thesis on this exercise as a measure of fitness. 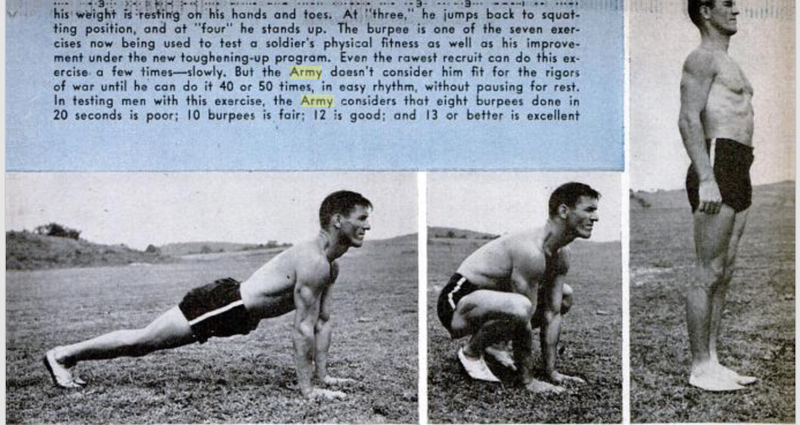 Subsequently, the burpee or squat thrust was adopted by the US military to assess the fitness of recruits in WWII. According to this Popular Science article from 1944 the army did not consider a soldier ready for the rigors of war until he could do 40 to 50 at an easy pace without resting. the burpee is probably the very best exercise for the military. Or should I say more specifically, for people being shot at by other people with guns. It stands to reason that if a soldier can’t quickly get down to the ground and then quickly get back up again, they’re simply fodder for target practice. A primary need is to be able to drop into a firing position and then bounce back up lightning-fast to move to a safe position — and without a certain standard of ability to complete that particular movement, they are at a significantly higher risk of getting shot than their other, more agile companions. It would be hard to design an exercise that puts a greater stress than multiple burpees on the autonomic reflexes involved in keeping blood flow to the brain constant (I’m somewhat reticent to mention this because I may soon see members of my gym doing it but if you had an exercise that involved standing on your head and suddenly flopping to the ground then jumping up to a standing position that would be a greater stress. If this hasn’t been invented yet, I claim credit and would like it to be called a pearson ©). My patient said that after doing his required 30 burpees he would stagger around in circles with a sensation that he couldn’t see properly and that he was in imminent danger of passing out and falling down. Added to the above-mentioned issues of moving from supine to standing we are now moving from a squat position. In this position the large muscles in the legs are tightened, thus squeezing blood back to the heart and initiating reflexes that are the opposite of those needed to compensate when standing is resumed. To compound the confusion his body was feeling, my patient’s personal trainer had him jump or spring up from the squat position with his arms raised in the air and his feet leaving the ground. This further adds to the gravitational effects of blood pooling in the legs and abdomen. Dizziness due to OH is more common as we age. We don’t know exactly why but it is likely related to multiple age-related changes in the cardiovascular system and the autonomic nervous system. Some factors that may play a role include a decrease in baroreflex sensitivity, a decreased vasoconstrictor response to sympathetic stimulation, decreased parasympathetic activity and impaired relaxation of the heart muscle. It may be possible for the young and fit to do multiple burpees without dizziness but I suspect that the vast majority of sixty somethings are going to notice significant dizziness with this kind of exercise. Perhaps, personal trainers could change from the burpee to the Weak Horse, another exotic exercise and “toughening up” game that comes to us from the military. Dizziness experienced with aerobic exercise such as running or rapid walking can be a sign of a serious cardiovascular disorder and merits being reported to your physician. Low T and Me: Does Testosterone Therapy Increase Cardiovascular Risk? In the last year, several of my patients have asked me whether it is safe for them to take testosterone for “low T.” They were responding to media reports suggesting that testosterone therapy raised heart attack risk by one-third. I must admit, I had been skeptical of the legitimacy of the “low T” diagnosis. Many of the symptoms attributed to testosterone (T) deficiency, it seemed, were just part of normal male aging: decreased libido, fatigue, weight gain, and loss of muscle mass. Perhaps, I thought, men should just be more willing to exercise regularly and lose weight and accept the indignities of aging that result despite our best efforts. On the other hand, in the back of mind was the idea that perhaps I, as a sixty-something male with declining strength and endurance, could somehow forestall the ravages of aging by taking T.
I googled “low T” and immediately found some sponsored sites, including “is it low T.com,” which appears to be an educational site for patients. However, the one treatment option that they provide links to is made by Abbvie, the somewhat hidden host of the site. Abbvie is a pharmaceutical company that makes Androgel, the most widely prescribed testosterone cream. 1. Reduction in strength and/or endurance. 3. Deterioration in your ability to play sports. 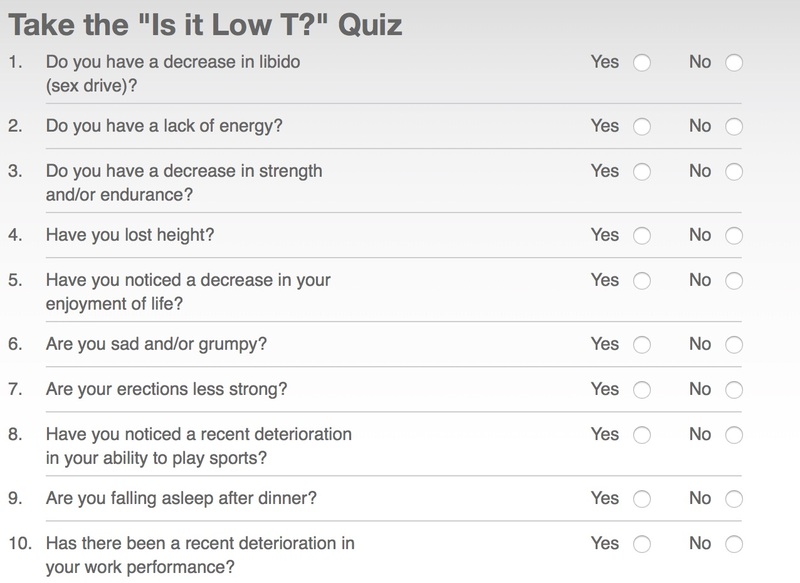 After taking the quiz, I was told that answering yes to 3 of the 10 questions strongly suggests you have low T.
In addition, according to the site, if you answered yes to question 1 (decreased libido) or 7 (less strong erections) you have low T.
Based on this quiz, I and 99% of men my age must have low T!! In the last 10 years, the use of testosterone therapy has quadrupled, driven by better formulations for testosterone delivery and by direct-to-consumer marketing campaigns that suggest that treating low T will reverse these normal consequences of aging. As a result, in 2013, 2.3 million American men received testosterone therapy and 25% of these men had no baseline testosterone levels tested. A year ago, the New York Times editorial board opined on the dangers of overprescribing testosterone and the influence of pharmaceutical companies in over-promoting the drug, in a piece entitled “Overprescribing testosterone, dangerously.” Articles like this are what have raised patients’ concerns about T therapy and increased risk of heart attack. There is a large body of evidence that shows an association between lower T levels and increased mortality and coronary artery disease. Lower T levels are also associated with higher risk of diabetes and the metabolic syndrome. Studies also show that T therapy in T-deficient men increase lean mass and reduce fat mass and are associated with a reduction in mortality. A recent review article by Morgenthaler, et al in Mayo Clinic Proceedings, provides a detailed and meticulous summary of these studies and data. Two recent studies contradict this large body of evidence and gained enormous media attention. The first, by Vigen et al in JAMA 2013, was a retrospective analysis of VA patients which has received extensive criticism for its statistical technique and has been corrected twice. The second study was by Finical, et al in PLoS One 2014, suggesting increased mortality in patients for 90 days after receiving their prescription for T. This study also contains methodologic issues and is hardly conclusive. -Make sure that you really have low T. Your total T levels should be less than 300 ng/dL done in a reliable, certified lab. -At this time, I don’t see solid evidence that taking T, if you definitely have T deficiency, increases the risk of cardiovascular complications or death. As with all medications, the shortest duration and smallest effective amount is what you should take. All medications have side effects, some that we know and some that we don’t know. Most of the studies that have been published were on small numbers of patients for short periods of time. -If you are overweight and/or sedentary, there is good evidence that losing weight and exercising will improve many of the symptoms ascribed to low T. These will also improve your life expectancy and lower your risk of heart attack. …And you won’t have to worry about any side effects! Do I have low T? Like all sixty-somethings my T levels are lower than when I was 30. My endurance is less. I’m losing height. Fat wants to build up in my abdomen, despite my best efforts. It’s only going to get worse, but I’m willing to accept these as normal consequences of the aging process, rather than introduce external T into my system with its unknown consequences. I will not go gentle into that good night but will continue to rage against the dying of the light without the wonders of pharmaceutical grade T.